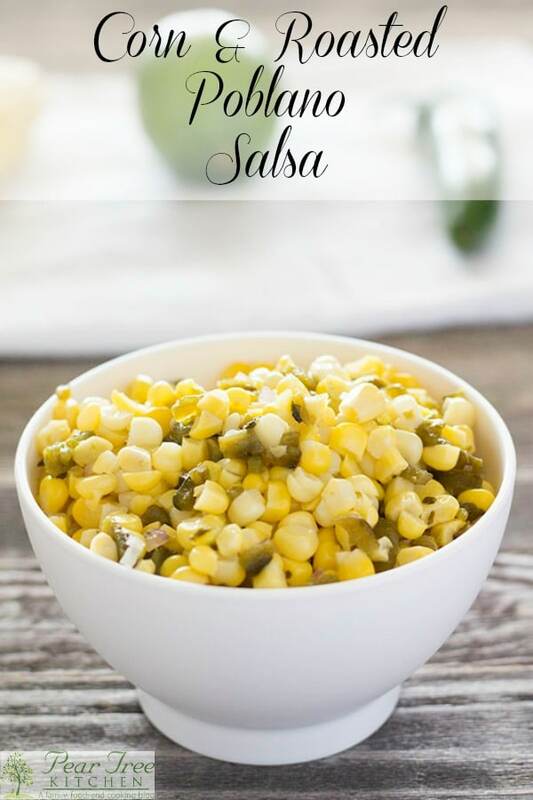 Corn and Roasted Poblano Salsa is perfect for topping burritos, tacos, or anything that needs a bit of sweet and spicy. 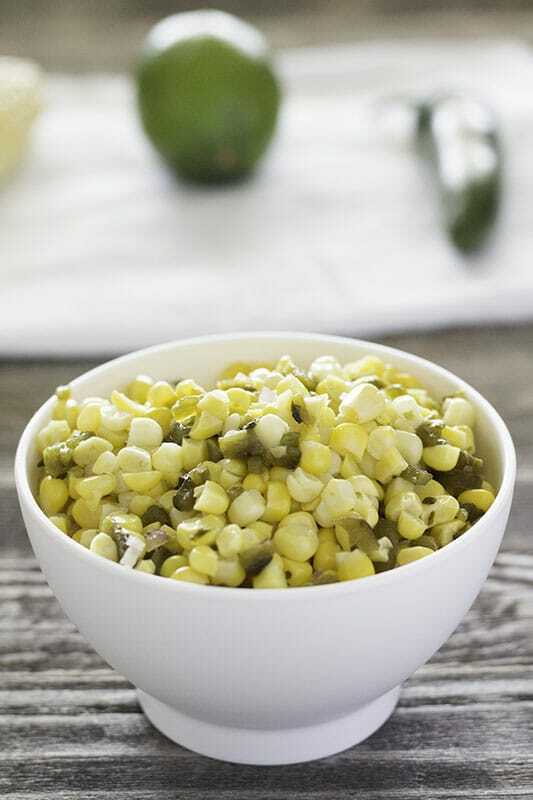 Easy to make with frozen or fresh corn, a roasted poblano, and just a hint of lime. Roasting your poblanos before adding them to any Mexican inspired dish gives the dish a smoky flavor. It’s very easy to do. I no longer have a gas stove, I use induction. Induction cooks like gas in most instances, but when it comes to roasting things over an open flame I am forced to fire up the grill. You can do this over a grill, just use a medium to low heat and grill the peppers on all sides until they are charred and have black blistered skin. You can also do this over a gas flame in the kitchen, or use a grill pan. I do not fire up the grill just for a few peppers. I don’t own a grill pan, although it might a good investment in the future. Instead, I put some foil over a baking sheet, spray it with cooking spray and add the peppers. I place my top baking rack about 6 inches from the broiler element and preheat the broiler. I broil the poblano peppers until they are beginning to blacken and char, turning them frequently to get all of the sides evenly roasted. When the peppers have been charred I add them to a heatproof bowl and cover the bowl with a kitchen towel. I let them sit on the counter, covered, for 10 to 15 minutes as I get the rest of my ingredients prepped. Once they are cool enough to handle I peel off as much skin as possible by rubbing them with a towel, paper towel, or my bare hands. I remove all of the seeds and all of the inner membrane too, but if extra heat is what you are looking for, feel free to leave some membrane. I personally do not like finding such hot little treasures in my Mexican food. 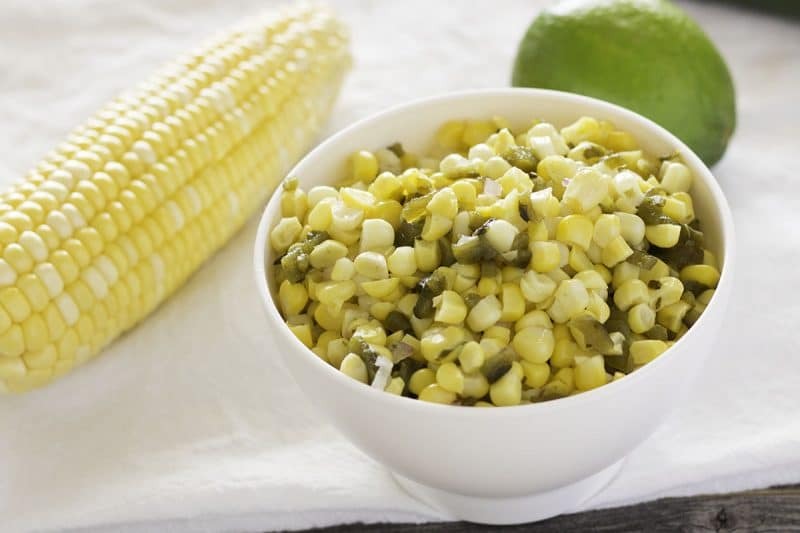 Frozen corn can be substituted for the fresh corn, no need to blanch it first, just allow the corn to thaw. I have made this salsa both ways and I much prefer the fresh corn salsa. It is sweeter and has more of a crunch in my opinion. 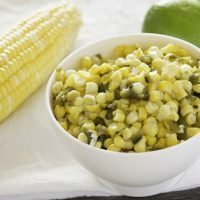 Corn and Roasted Poblano Salsa - Spicy condiment made with fresh corn and roasted poblanos marinated in lemon and lime juice. Tastes great with chips or on top of burritos and bowls. Cut kernels from cobs of corn. Bring a small pot of water to a boil and add corn kernels. Boil corn for 1 to 2 minutes. Drain corn in a colander and immediately rinse with cold water. Add corn to a large bowl. Add red onion, roasted poblano, and jalapeno if using. Mix to combine. Add lemon and lime juices, mix well. Allow salsa to sit for at least 2 hours to allow flavors to combine. Nutritional data may appear differently in different calculators, please check your favorite calculator if nutritional data is critical.